Don't mind me and my shameful lack-of-blogging... No excuses. And it's a bummer that I haven't kept up, because I have SUCH a backlog of awesome recipes to share!! Without further excuses or rambling though, let me just jump in with this recipe because I'm super-excited about it. As I may have mentioned, I am NOT a breakfast-eater, but I know I SHOULD be, so I started looking for a muffin or bar recipe - something marginally healthy that I could grab and and eat on the run. Additionally I wanted it sort-of spicy and dense and "carrot-cake" like. I didn't have a lot of luck however, for several reasons; First of all, I LOATHE bananas and it seems every vegan muffin recipe out there uses bananas. Now, I know I can substitute applesauce, pumpkin puree or other things for the bananas, but problem number two... I am NOT a baker. So I was looking for a recipe I could make exactly as written, at least the first time I attempted. Additionally? I am not gluten-free and (apologies to all of you who are) since my baking skills are minimal, I didn't want to attempt something with ingredients I'd never worked with before. Finally, after finding about five recipes that seemed *almost* close enough, I chickened-out on tackling them myself (we vegans can "chicken"-out, right? That's OK, isn't it?) and I forwarded all the recipes to my long-suffering boyfriend, along with my criteria, and said "HELP ME!". And he did, of course, because he's awesome that way! He's also a great baker and has infinitely more patience for measuring and weighing and kitchen science voodoo than I do. And he knew I hated bananas! So he threw the recipes out, did a little mixing and stirring and measuring and tweaking - and MAGIC! Big, beautiful, dense, spicy, carrot-y muffins with NO oil, very little (or no) sugar, and lots of awesomeness! Long story short - this recipe is really his. But he said I could publish it here on my blog. So I am. 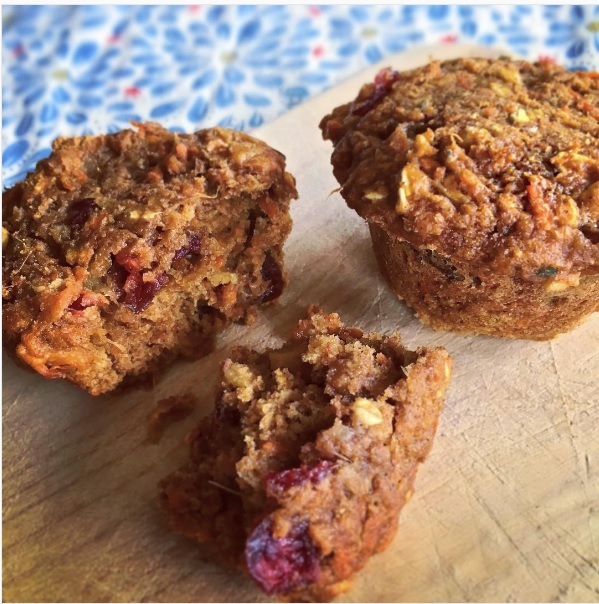 Because I think everyone should have access to awesome carrot-cake-inspired breakfast muffins! One note, this recipe makes 24 muffins. Halve the recipe if you want. There are 4 people in my house though, and these disappear quickly!!! They'll keep for at least 4 days on the counter (maybe longer? We always eat them!). I also keep some in the freezer. Either way, they're now a breakfast staple, everyone grabs a couple, they defrost quickly and are quite filling. They're very dense and moist and even though they're oil-free, they don't dry out much. Personally I sorta like them after a few days when they've dried just a slight amount on the outside, but the interior is still soft and cake-y. Put muffin papers in standard-size muffin pan, or spray with cooking spray. Get out two bowls: one for wet ingredients and one for the dry. Combine dry ingredients in one bowl and whisk. Shred carrots and ginger in a food processor. Combine carrots and ginger with other wet ingredients in another bowl and mix well. Fill each muffin cup almost full with the batter (it doesn't rise much). Bake for about 35 minutes, or until muffins are fully cooked through the center. (Check with a toothpick, they might be moist but shouldn't be gooey). Let cool for about 15 min and then remove from pan to wire rack. Store loosely covered at room temp. or freeze in individual ziploc baggies. YUM! I love muffins! I'm a big fan of breakfast, but I love having muffins as afternoon snacks. These sound amazing. Nice to see you back, Tofu Mom!